Lee Campbell is the wine director for Andrew Tarlow’s Brooklyn restaurant group, and curator of the popular list at Reynard, located in Williamsburg, Brooklyn. Known for her favor towards natural wine and her ability to create a list that Â speaks to a personality; all her own, the lively wine steward is responsible for a total of six restaurant experiences under the group’s umbrella. Now, a fabulous wine expert and somewhat of a restaurateur, Campbell admits that, despite her expertise, she sort of ‘fell’ into the industry. Growing up in West Indian culture, she says wine wasn’t common at her dinner table, and her restaurant experience didn’t exceed beyond two short, unsuccessful, stints as a waitress in college. But one evening, while having dinner near Capitol Hill, and contemplating attending law school, Campbell dined at a local restaurant and experienced a meal that caused her entire life to pivot. 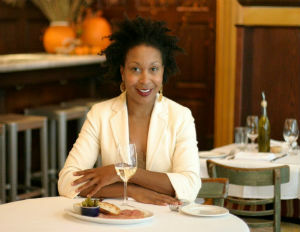 BlackEnterprise.com caught up with Lee Campbell to talk her journey into the wine industry, a day in the life of a wine director, and the secrets of organic wine. BlackEnterprise.com: Can you tell me how you first got into the wine industry? Campbell: I got into wine, really, through my love for food and restaurants. So when I first considered working in this world, it really came through directly working for restaurants, working in food, becoming a restaurant manager and then, eventually, transitioning into wine. I didn’t grow up with a lot of wine in the house. My dad drank a little bit of wine, but I’m West Indian so we drank more rum than anything else. Â It wasn’t really on my radar until I got into the restaurant business and started to understand wine, and how important it was to the restaurant experience. I was also working at a restaurant, as a manager, and it seemed to me that the Sommelier had the coolest job in the room. I read that you have a background in politics. How did you transition into wine? I was living in Washington D.C. and was really considering going to law school. I’d done some internships on Capitol Hill and so my hope, sort of my dream, was to work on the hill in some capacity. I was in D.C., thinking about going to law school, and I had this amazing meal at Restaurant Nora. It’s in the Dupont Circle neighborhood. I basically woke up the next day and, almost on automatic pilot, went to the restaurant, knocked on the alley door and asked if they had a job for me. The meal was so transformative, and all of a sudden nothing else seemed to matter. I’d done two stints as a waitress in college, and I was really, really bad at it. Other than that, I had worked in a Dairy Queen growing up; that was the extent of my profession in the food industry. The person that opened the door [at restaurant Nora’s] was one of the owners. He took me in immediately, and the chef there, Nora Pouillon, was in the middle of getting ready to publish a cookbook so she needed someone to act as a life and professional assistant. I became her assistant for about a year, and it was sort of my entree into the industry. What has it been like as a woman; especially a black woman, in a male dominated industry? I have always been in spaces where I was the minority. I got used to being the only black girl in the class when I was 5 years old so, in a lot of ways, it’s my normal. While I’m always cognizant that we would love to see more people of color and more women in leadership in this industry, I’ve had a lot of support. I’ve had some really great mentors. I’ve had people that have Â helped me do everything that I’m doing now. I feel I’ve had amazing opportunities, which I’ve earned but, also, that people have gone out of their way to open up for me. Opportunity is what you do with it. You know people will give them to you but then you have to excel, and my passion has always helped me to excel. But, it’s important to me to act as a mentor to women and people of color who are also interested in wine. So, pretty much anybody who sends me an email, I try to write them back and give them advice. Can you walk me through what your day as a Sommelier looks like? We have five different properties at our company. It’s fun because I get to run around to all of the different restaurants and figure out what everybody needs, but because my primary job is not really to do work in the dining room; my primary job at this point is more of an administrative operations aspect, I spend the first part of my day ordering wine. It’s a lot like going shopping every day, but you really have to be paying attention to what’s in the wallet. Usually in the afternoon, I might taste some wine with one of my sales reps, and then I’ll go into some sort of wine training component with my staff. Speaking of wine-tasting and training, I’ve read about the natural wine industry and there’s some controversy regarding natural wine. Can you talk more about this and explain your support of natural wine? I think part of the problem is, because there are no strict labeling laws, people don’t understand that wine is not inherently natural. Wine is as commercial as it can be, as any other product that we are buying and putting in our mouths. If there was more awareness about how many chemicals actually go into a bottle of wine, there would be a lot less controversy about natural wine. There’s not much information about what’s really going on in many of the commercial wineries. Â It’s really important for me to encourage people to buy wine that’s had as little intervention as possible in the winery, and wine for which the grapes have all been grown naturally and organically. Alcohol in moderation is a great thing, but if that alcohol can also be something that’s really an expression of the land and an organic thing, that’s even better.